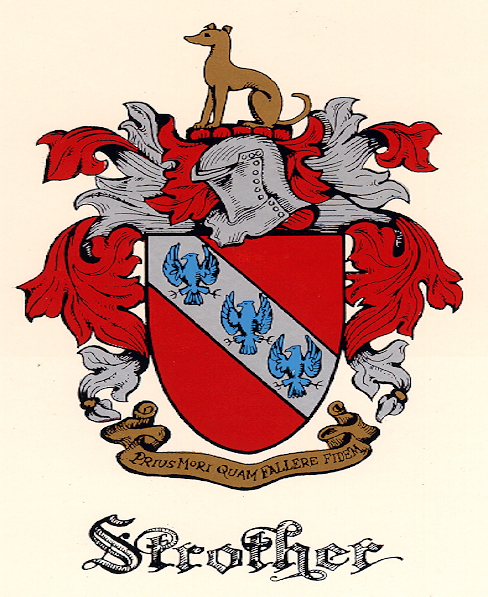 The Strother Coat of Arms is described in Burke's General Armory (London, England) and again in Bolton's American Armory as Gules, on a bend argent, three eagles displayed azure. Crest, a greyhound sejant. The motto is in the Strother genealogy in Some Prominent Virginia Families, Volume 4, as "Prius Mori Quam Fallere Fidem" (Yield to death rather than betray trust). In describing the coat of arms, the first word, Gules (red), indicates the main color of the shield. In heraldry, the word "bend" indicates a diagonal band about one-third of the shield width placed from the upper right hand corner of the shield to the lower left side. Note that in heraldry, the right side of a shield is the side on the right of one wearing the shield, i.e., the left as one views it. In this case, the bend is argent (silver). On this bend argent are three eagles displayed in azure. In heraldry, an eagle displayed is one with its wings spread and these are azure (blue). The bend is a bearing of high honor representing the scarf or shield suspender of a knight or of a military commander denoting defense and protection. Ancient writers say that the eagle is the most clear-sighted of all birds with eyes are so strong they can look directly into the sun. The eagle has mercy and generosity of soul. It scorns to fight small creatures and will not bully the weak. The eagle was adopted as the symbol linking the ruler with the divine and is the king of all fowl. In heraldry, red signifies courage and magnanimity; silver, sincerity and peace; and blue, loyalty and truth. The crest is a greyhound "sejant", meaning sitting and/or gold. The dog comes closest to possessing the virtues, and few of the faults, of man. It is loyalty unquestioned; ever on the watch; senses danger; is a symbol of vigilance, courage, fidelity and loyalty to a cause; a grateful mind and a friend in adversity. The gold symbolizes generosity and elevation of the mind. The dog symbol is quite in line with the family motto "Yield to death rather than betray trust". This coat of arms and the accompanying explanation is proudly displayed as a symbol of the history of this old and highly prominent family of Strother.